Well, now there's a Bible definition of what constitutes the wicked and what constitutes the wise. The wicked are simply those that are sinning and all have sinned but sin in your Bible is the transgression of the law of God. And again, you find the beginning of wisdom is the fear of the Eternal. "The fear of the LORD [the fear of the ETERNAL], is the beginning of wisdom: a good understanding have all they that do his commandments:" (Psalm 111:10) And there you are. Have you ever noticed how Jesus said to His disciples that many of the prophets of old had desired to know the things that He was teaching them? That they had searched diligently to know those things but they could never know them; even though they were, as Peter said, "holy men of old" that were moved and inspired by the Holy Spirit in the writing of the word of God. (II Peter 1:21) And even though they were holy men, and even though they had the Spirit of God and were inspired in the writing of the holy scriptures, very often they did not understand what they wrote. Now, knowledge has been revealed progressively. In the days of Christ, some were able to know some of the things, that had not been known five hundred, six hundred, a thousand years before. But, my friends, in our day, many things are being opened up and revealed that were not known even in the days of Christ. This is the time of the end. And the words of Daniel for instance were closed and sealed until the time of the end. Now, we find that God had locked up these prophecies but there are certain keys that unlock the doors. And if you have those keys, you can begin to understand. And without those keys you cannot understand. That's all there is to it. A good understanding have they that do His commandments; that's another reason why so many do not understand today. People want to plead the blood of Christ, people want to believe in a dead Christ, but they do not want to obey God! Now, the only reason Christ had to die was because we'd been disobeying God. And He died to reconcile you to God so that your sins no longer cut you off from God, because our sins cut us off from God. And once we're reconciled to God, then through the life of Jesus Christ, through His resurrection, we can receive the very life of God. And salvation comes through the life of God. And through the life, the resurrection of Christ. That's made possible by His death. And so, His death makes it possible for us to receive the Spirit of God, which is the love of God shed abroad in our hearts. The love that fulfills the law and makes it possible for us to be obedient and when that love comes from God that fulfills His law, then you have the very righteousness of God, then you become like God because you're living like God, you are thinking like God and that my friends will lead to the development that will bring you salvation! Now, one of the mysteries of the Bible, that very few have ever understood is the identity of this mysterious man; Melchizedek. 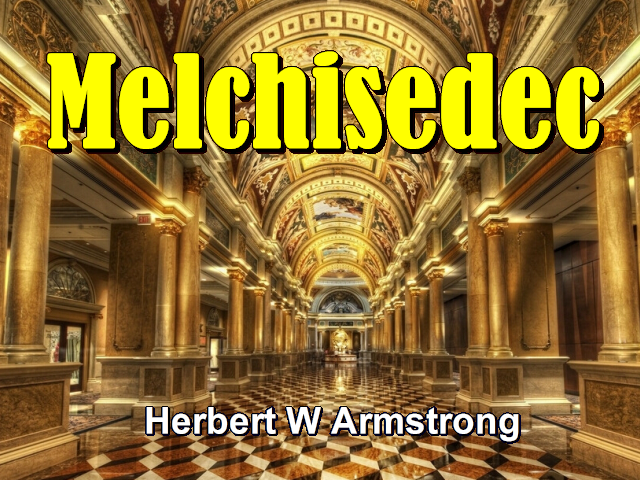 Who is or who was Melchizedek? We've been going through this wonderful but little understood and little read book — Hebrews — the Priesthood Book that tells about the job that Christ is doing right now. Jesus Christ has a very high office, He has a mission; a job; a profession; a high office and He is laboring there. He doesn't sleep you know, He's not physical, He's not human, He's been made divine. He has been made God. He was made flesh and dwelled among us. But now, He has been made God, He is born a son of God by a resurrection from the dead as you read in the first chapter of Romans. And He is the firstborn of many brethren. And He's at the right hand of God the Father sitting on His Father's throne. He isn't yet sitting on His own throne, He is sitting on the Father's throne. And He is there as your High Priest. To minister for you. And to see that if you conform to the terms and conditions which are very simple; that you repent, that you obey and that you believe. And He is there to see that your prayers get answered! There's a reason why they aren't answered. One reason is that you don't repent and you don't obey! Another reason is that you don't come boldly to that throne of grace. That you can find help; grace to help in the time of need. (Hebrews 4:16) No, you neglect this great salvation and it means a whole lot, it's a very practical thing and in your everyday life to deliver you out of all your problems and troubles, to give you wisdom to help you along. Yes, even give you the breaks and see that things work out right for you. Well, in this sixth chapter of Hebrews, we have come down to the place where we read about Christ having entered within the veil, in other words into the very throne of God up in heaven. "Whither the forerunner is for us entered, even Jesus [that is the very throne of God], made an high priest for ever after the order [or of the same rank as] Melchisedec." (Hebrews 6:20) Because that is what it means. Now, who is this Melchizedek? Now, first, Melchizedek was God's High Priest. It was way back at the time of Abraham, He'd always been a High Priest but we only find matter recorded during the time of Abraham. Now incidentally there's a little something — let me stop and explain. In the Bible, there were many, many, many centuries prior to Abraham, but you don't read of very much in the Bible before Abraham. You begin to find Abraham introduced here in the twelfth chapter, well he's introduced first in the eleventh chapter in his genealogy. And these first eleven chapters of the Bible cover a great long period of time. But not very much is revealed to us about that time. Very little is revealed to us about what happened back before the flood. Of course, the flood is something that is very fashionable today to laugh at and sneer about. I wonder if you realize that if our geologists would just wake up and be willing to confess any of their errors and really look for the truth, that there is ample evidence in geology and in the rock strata of the earth that proves there was a flood. But, of course, since they decided there wasn't a flood, they can't admit that kind of evidence. Well, I can produce evidence that geologists cannot refute. Of course they can laugh, they can sneer, they can jeer, they can turn and run the other way, but they can't refute it. And of course when you can't refute anything and you are unwilling to admit it, too much human pride to ever admit we'd ever been wrong, isn't there? The way to get around the thing is just to sneer at it and ridicule it. That makes other people think that it's insignificant and it isn't true. That's the way to get around truth and get away from it, if you don't want to accept truth. There's a lot of that going on in this world. Well, there's very little back here in these first chapters, in other words, God reveals very little of the history of what happened in that time and there are no profane records of history about it, at all. A lot of men not knowing anything about it and not having any historic record, add a good many thousands or millions of years that they think went on there. There's no evidence, there's no proof. They've never given you any proof, you've never seen any proof, of course, because learned men looked dignified and maybe grow a beard to look very dignified, and pronounce that they're scientists and tell you that a certain thing happened and most of you just like a lot of dumb sheep just believe it and follow it, swallow what ever they want to tell you; hook, line and sinker. God's word says, "Prove all things." (I Thessalonians 5:21) Did you ever stop to prove some of these things? You're going to get your eyes open when you do. Well, there isn't very much given about anything until you come to the time of Abraham, of what happened; very, very little. And the prophecy is merely history written in advance. And, when we get up to the time of the coming of Christ, there is very little written about what's going to happen way off there in advance, in the future that hasn't come yet. You have to remember, my friends, that the Bible is peculiarly the book of Israel and about Israel and Abraham is the father of Israel. Abraham is also the father of the faithful. And if you don't become an Israelite, you have no salvation. A Gentile is without God, without hope, without Christ and without any salvation. He's cut off from salvation. But, through repentance and through Christ, he's pictured as a branch on a wild olive tree. He can be cut right off of his nationality or his wild olive tree and grafted contrary to nature onto the natural olive tree which is Israel. You read of that in the eleventh chapter of Romans. Now, notice, Melchizedek was the king of Salem. Salem is the original Jerusalem. It now is called Jerusalem but that's just Jeru-Salem. They prefixed Jeru on the front of it and they call it Jerusalem now. Now, Hebrew words have meaning; the meaning of the name Melchizedek is 'king of righteousness.' Now, if we would translate that Hebrew word into English, we wouldn't say Melchizedek we'd say 'king of righteousness' and that would be His name. And, Salem means 'peace,' or Jerusalem means 'peace.' It's the city of peace. Only it hasn't known peace because of the ways of mankind, but it will yet know peace forever. So this Melchizedek, whose name was 'king of righteousness' was 'king of peace.' Why? The king of righteousness would also be king of peace because righteousness produces peace. Righteousness is the way to peace. It's unrighteousness that provokes and produces war, my friends. So, naturally, He was the king of peace and He was the king then of the town called Salem, that became the city of Jerusalem. And it is stated that He was the priest of the most high God! Now, Melchizedek is mentioned again in Psalms 110:4 and that is quoted in Hebrews five, six and seven. Now, since God names people or things what they are, that was His name, King of Righteousness. Now, I want you to pause and think of that for just a moment, King of Righteousness. Jesus said there is none good but one: That is God. (Matthew 19:17) And we find that human self-righteousness before God is nothing but filthy rags. (Isaiah 64:6) None can be righteous but God or one who has been made righteous by God's power. You can be made righteous if you will yield and surrender to God and have faith — faith in Christ. And also faith in God, for that matter. Until Christ is in you. You can be made righteous. They were two different persons. Now here is Melchizedek. Back in the beginning of your Bible, "In the beginning God created the heaven and the earth." (Genesis 1:1) Now what is the Hebrew word there for God? The Hebrew word was Elohim. And it means, the Almighty, the Ever-living, it means the Supreme One, but Elohim, my friends, is in a plural, a plural number. It's plural and it is a word similar to a word like family as I've explained so many times, a word like church. Now you read about the Church — it is one Church, not two churches, not five churches, not hundreds of churches; one Church, one body of Christ but many members. Many members but the one Church. And that one Church infused with and led by the one spirit, the Holy Spirit of God, yet many members. Your human body, one body, but many members. You have or should have, ten fingers, ten toes, two eyes, a mouth and a nose; two ears. Hope that we all have all of those because those are very important. And, so my friends, God is really a family or a kingdom of persons. Now here is one of the persons of the very Godhead, this Melchizedek. That's becoming more and more plain as we look into it. King of Righteousness, think of that. Also King of Peace. Now notice without father, without mother; without descent. He was never born, like humans are, He had no descent from another, He is self-existent, has always existed. Course your mind can't contain that. Now your mind can't image anyone that never came into existence. But, if He had to come into existence, what power, what force, what person brought Him into existence? Your mind can't conceive that either, can it? You just have to admit your mind can't go that far. It goes clear to eternity. Think of it. God has always existed. My mind won't quite grasp that. I don't think yours will either. God always will exist and you, my friends, too can have eternal life. And live for ever and ever from this time on, the only difference is that there is a time when you and I began to exist. And there was a time prior to that when you and I did not exist but there has never been a time when God did not exist. And there has never been a time when this Melchizedek did not exist. Having neither beginning of days nor end of life therefore He has always existed — from eternity to eternity. Now He wasn't created like angels, angels are created beings and there was a time when no angel ever existed. Then there was a time when they came into existence when God created them. He has always existed. Now, He is now priest, He continues as High Priest. Yes, Melchizedek continues High Priest right now. Now, we're coming to a little more. There's only one High Priest, there can't be two High Priests. One higher than the other, that would be like the movie that Charlie Chaplin made here a good many years ago. If you remember, I think it was called 'The Dictator' and he had Hitler and Mussolini there. Now, let me see, he acted the part of Hitler, didn't he? I forget who acted the part of Mussolini. Anyhow, they got into a barber shop and there were two chairs in the barber shop, and one of them I don't remember which, he sort of jacked the chair up, you know how you can a barber chair, to make it a little higher, he wanted to be a little higher than the other. Well, I think probably Mussolini did that and Hitler wasn't going to stand for it. He was going to be on top of Mussolini, so he jacked his chair a little higher. And they kept going and of course, these trick barber chairs in the movie scene, kept going until they hit the ceiling. And of course we all screamed with laughter and it was so true the nature anyway how those men had so much egotism; each one wanted to be higher than the other. Well, now if you had two High Priests, my friends, then that's probably about what would happen. Which one going to be the highest? And, each trying to get higher than the other. No, there's only one High Priest. Because there's no confusion in God's Kingdom like... it was funny to look at, of course, in a crazy slapstick comedy of the kind. But, there's only one High Priest. Now, this says that He abides, that is He remains, continues, permanently, continuously the priest and a High Priest, because He wasn't any low priest. God the Father is not the priest of God, but Christ the Son is. And yet in the days when the Apostle Paul lived and wrote shortly after Jesus had ascended to heaven, Jesus became our High Priest. And scripture states that even then Melchizedek abideth and this was long after Christ had become High Priest and here the Apostle Paul is writing that Melchizedek remains still and is now High Priest, because that's what that word abideth means. Does now "abide a priest continually." (Hebrews 7:3) And the Moffat translation says "...continues to be priest permanently." And this other Revised translation, "...continues a priest forever." Now, they all mean the different words there but different translations, they all mean the same thing. And so, Melchizedek is still the High Priest today and will be forever. And at the same time, Christ then is today and shall be forever, High Priest, same rank. My friends, it begins to become unavoidable that they are one and the same person. Are there two high priests? Why, it's impossible. The conclusion then is inescapable. Contrary to many a cherished men-thought idea, and men have ideas. Now a lot of people that have had a pet idea, they love their idea — they wouldn't give it up, not for anything in the world. No, they may face the choice of giving up their pet idea about something like this or giving up their life for eternity, but they'll give up their life before they'll give up an idea that they treasure. They'll write in and tell me that I'm ignorant, that I'm wrong, that I don't understand, but they'll never admit that they are wrong. My friends, do you know what worship is? If you worship anything or anybody except God, that is a capital sin, and let me tell you right here, very few people know what worship is! Most of you people are worshipping things or people other than God and you're sinning and you don't know it. Because you don't know what constitutes worship. Now, a Bible definition of worship, is in Revelation chapter thirteen and verse four. And here it's speaking about the Beast which is the Roman Empire and as it is to be resurrected. And it says, our people here are worshipping the Beast! And it says that they will worship the Beast; how did they worship? Saying, "Who is like unto the Roman Empire? Who's like unto this Beast? Who is able to make war with it?" (Revelation 13:4 paraphrased) Now my friends, a certain amount of the right kind of patriotism is a good thing. Patriotism, if it is worshipped is all wrong. But patriotism if it is mere loyalty is alright. Oh my time is up, I didn't realize it. Well, anyhow, that is worship and here the Bible actually pays worship to this Melchizedek and so He is greater than any archangel — He is Christ! Now, I'll just have to bring it to a close.